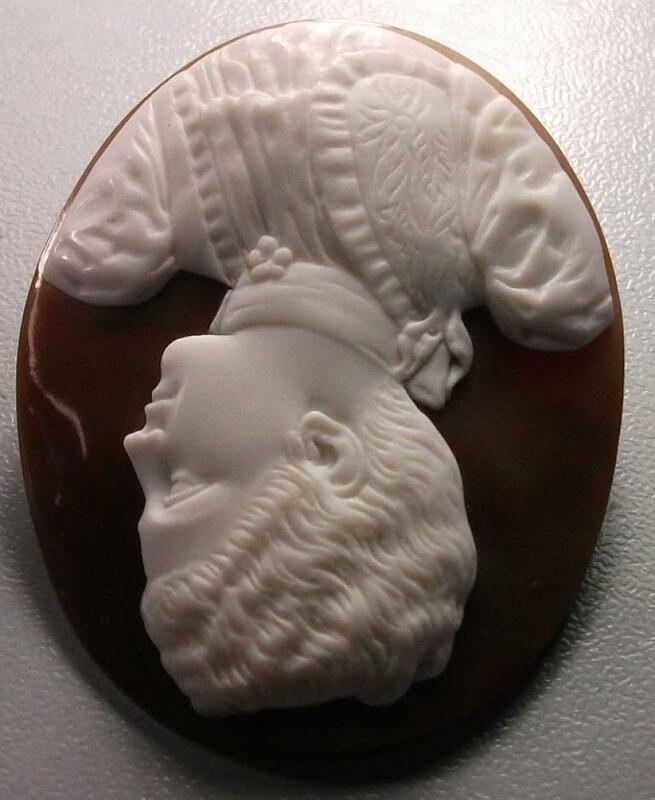 Material: Sardonyx Shell, Case is Faux Ivory. Size: 2" by 1 5/8 ". 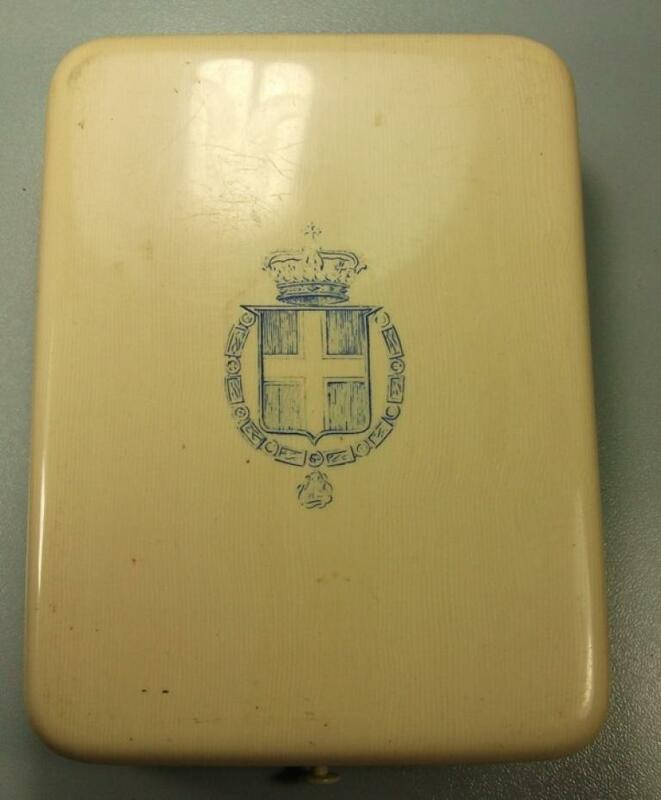 Original Fitted Case is 5 2/8" by 3 7/8", the case shows the arms of the Italian Royal House on the lid. 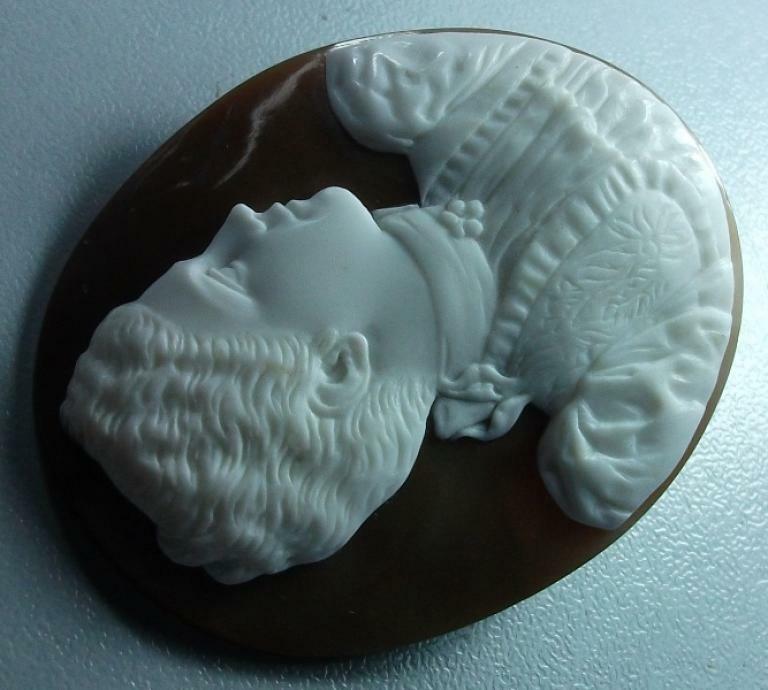 Date and Origin: Circa 1890/1900 Italy. Conditions: Excellent, a natural line in the shell only visible when cameo is backlit, a smallest chip on the back edge of the shell at circa 3:00 o'clock. 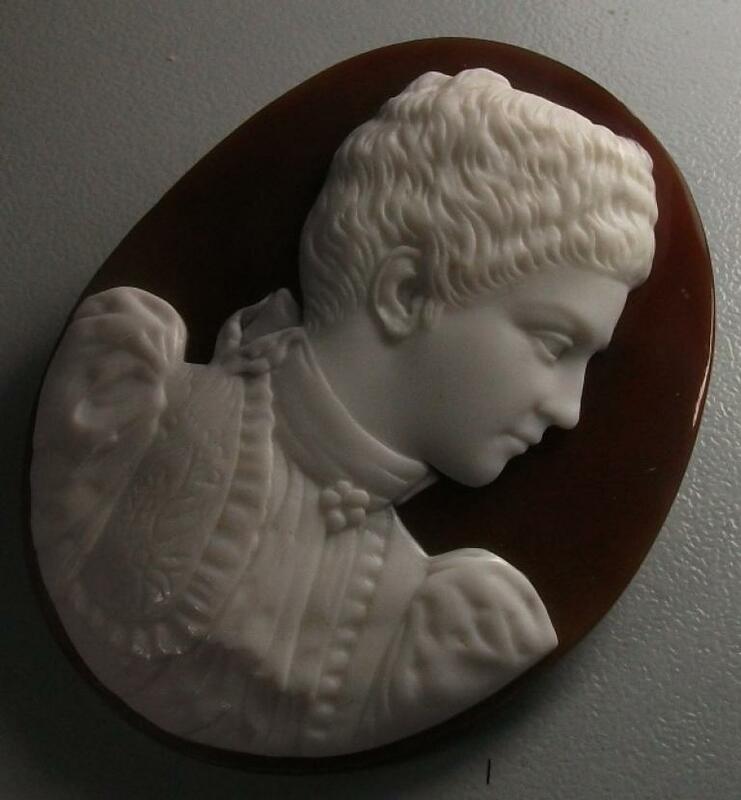 Museum Quality cameo depicting a rarest and never seen before subject. Queen Elena of Italy. 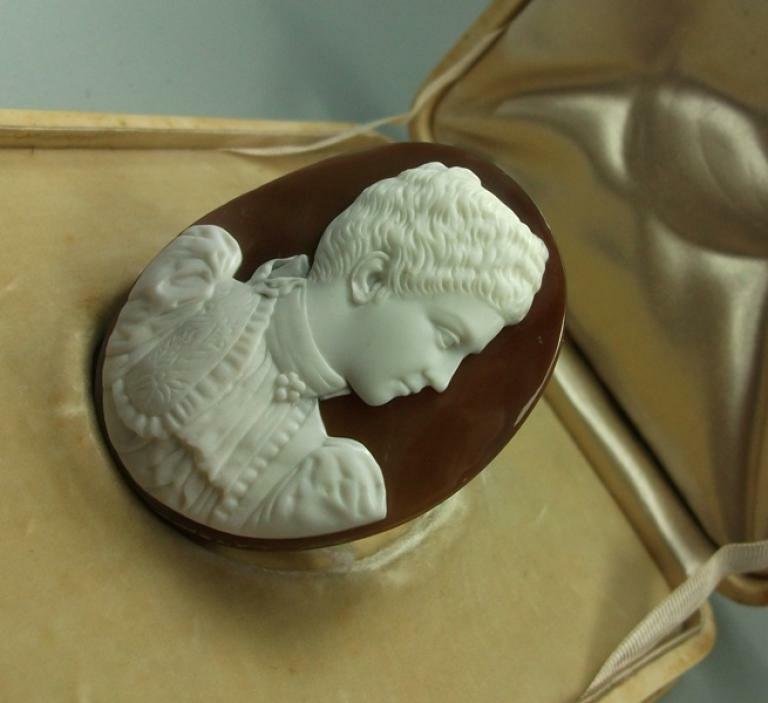 The cameo is superbly carved and is still in its original fitted case with the arms of the Italian Royal House on the lid still very visible. 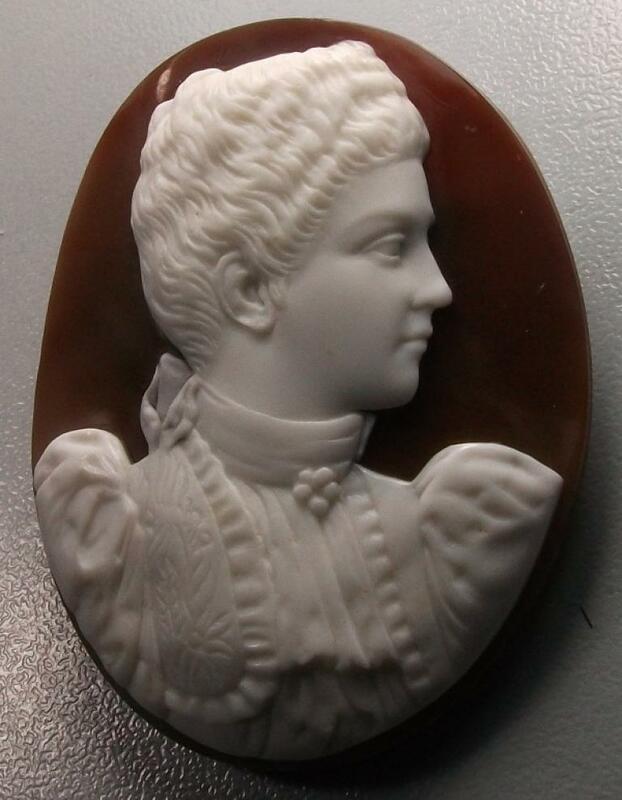 The cameo was probably taken from the picture below which dates back to circa 1890, look at the dress that she is wearing, it is the same one, the same embroidered flowers are on her dress and on the cameo. The details, even the smallest ones, are perfectly rendered. 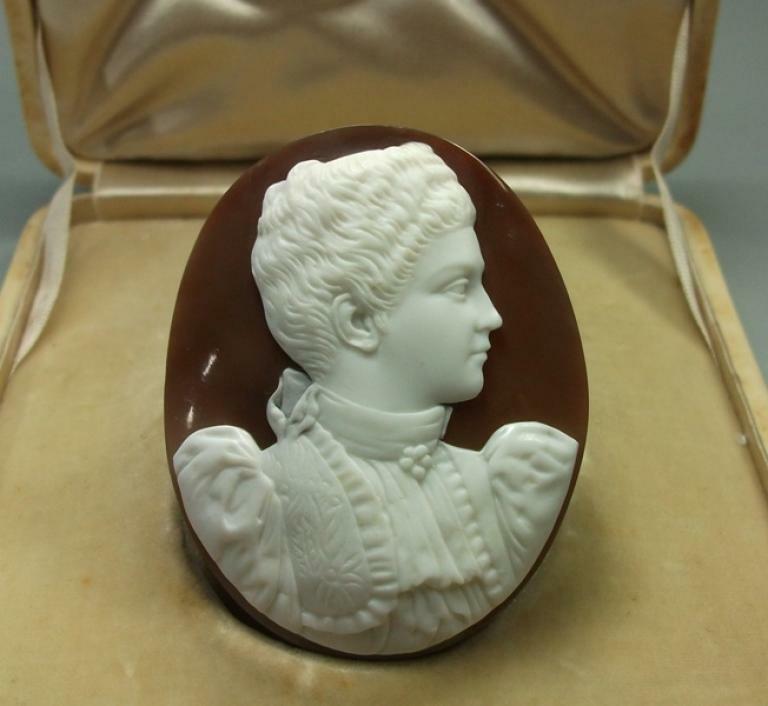 A superb cameo which is a piece of history. 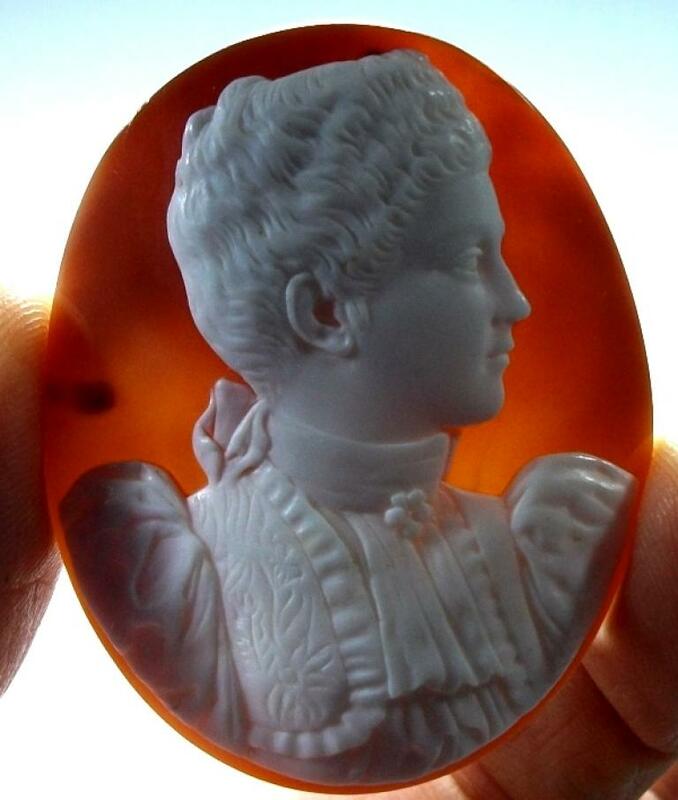 A cameo of Queen Elena of Italy was also carved by Antonio Girardet at the beginning of 1900's, it is carved on onyx and is now in a Museum in Rome. 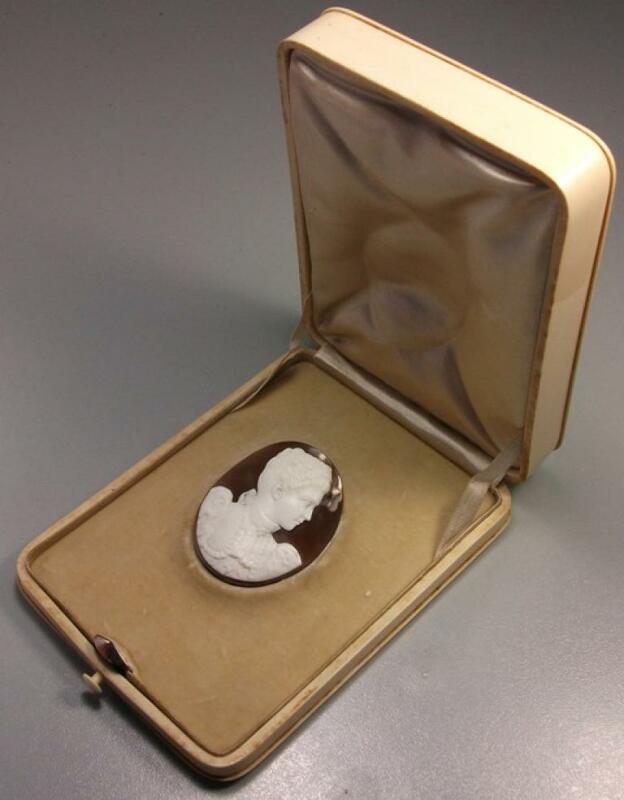 The real ivory case is another beauty, lined inside with ivory velvet and silk. You can't find anything like this cameo anywhere. 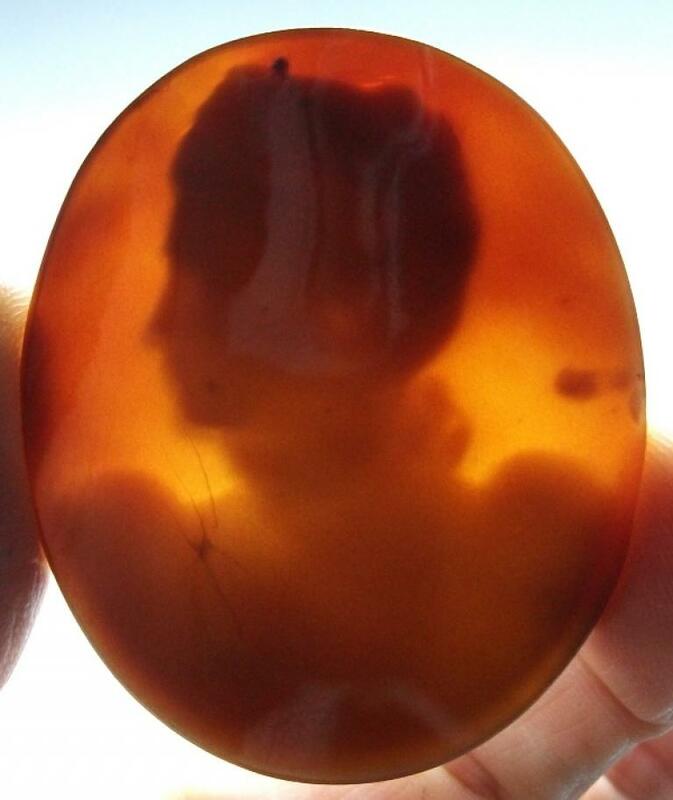 A great find which I was fortunate to acquire for all the collectors who love history and art. This probably was commissioned from the Royal House to make an important gift to someone. That is incredible that it is arrived to us in mint conditions and still in its fitted case. A true artwork which would deserve a place in a Museum. 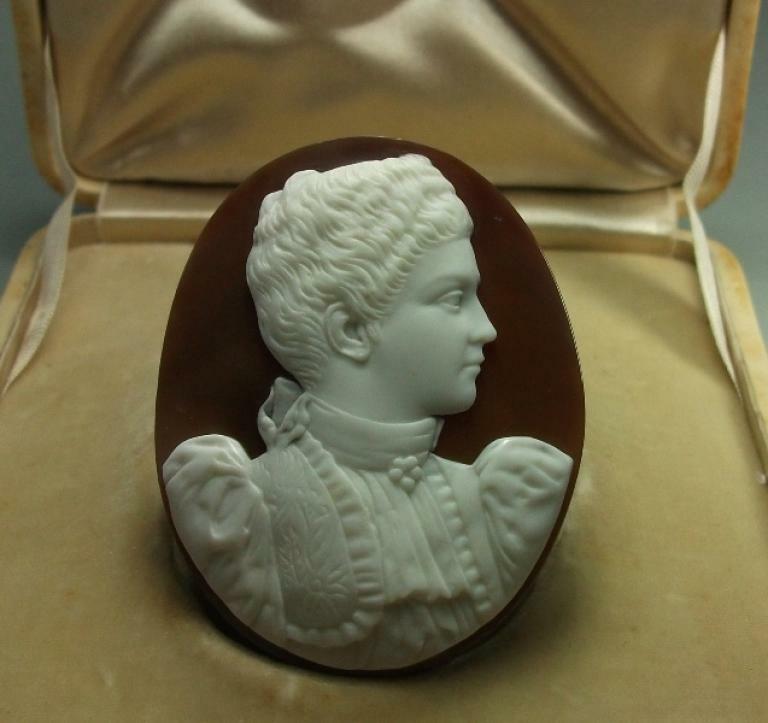 A piece to collect and especially for the ones who collect historical subjects. Elena of Montenegro (born Princess Jelena Petrović-Njegoš of Montenegro) (8 January 1873 – 28 November 1952) was the daughter of King Nikola I Petrović-Njegoš of Montenegro and his wife, Milena Vukotić. As wife of Victor Emmanuel III of Italy, she was Queen of Italy from 1900 until 1946. As the result of Jelena's marriage to King Victor Emmanuel III of Italy on 24 October 1896, she converted to Catholicism and became Queen of Italy when her husband acceded to the throne in 1900. Her mother was so distressed with the fact that Elena had changed her religion that she refused to come to the wedding ceremony in Rome. Due to the Fascist conquest of Ethiopia in 1936 and Albania in 1939, Queen Elena briefly used the claimed titles of Empress of Ethiopia and Queen of Albania; both titles were dropped when her husband formally renounced them in 1943. She influenced her husband to lobby Benito Mussolini, Prime Minister of Italy, for the creation of the independent Kingdom of Montenegro in 1941. In 1943 she subsequently obtained the release from a German prison of her nephew, Prince Michael of Montenegro, and his wife, Geneviève. Prince Michael had been imprisoned after refusing to become King of Montenegro under the protection of Italy. On 11 August 1901, following his father's assassination, Victor Emmanuel ascended the Italian throne. Officially, Elena assumed her husband's whole titles: she became Queen of Italy, and with the birth of the Italian Colonial Empire she became Queen of Albania and Empress of Ethiopia. On 28 December 1908 Messina was hit by a disastrous earthquake. Queen Elena helped with the rescuers, as some photographs show. This helped to increase her popularity within the country. During the First World War Elena worked as nurse and, with the help of the Queen Mother, she turned Quirinal Palace and Villa Margherita into hospitals. To raise funds, she invented the "signed photograph", which was sold at the charity desks. At the end of the war, she proposed to sell the crown treasures in order to pay the war debts. 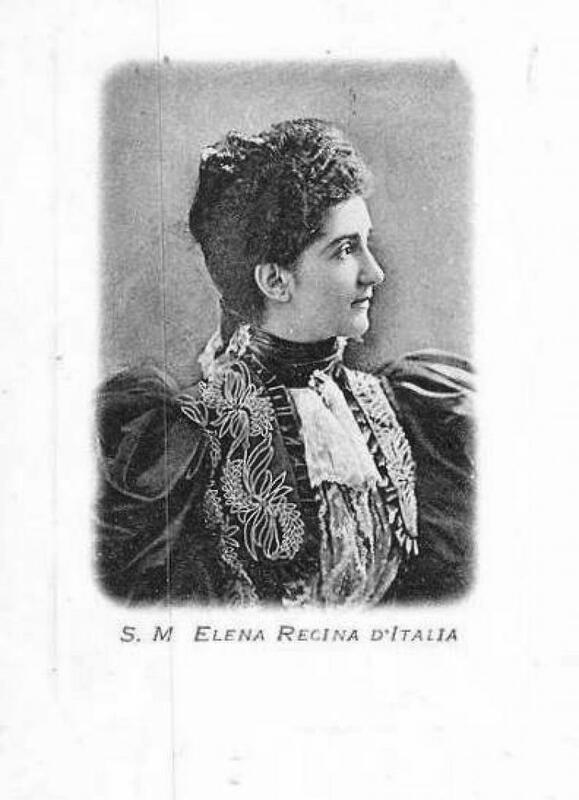 Elena was the first Inspector of the Voluntary Nurses for the Italian Red Cross from 1911 until 1921. She studied medicine and was able to obtain a laurea honoris causa. She financed charitable institutions for people with encephalitis, tubercolosis, former soldiers and poor mothers. She was deeply involved in her fight against disease, and she promoted many efforts for the training of doctors, and for research against poliomyelitis, Parkinson's disease and cancer. On 15 April 1937 Pope Pius XII gave her the Golden Rose of Christianity, the most important honour for a Catholic lady at the time. Pope Pius XII, in a condolence telegram sent to her son Umberto II for the queen's death, defined her a "Lady of charitable work". In 1939, three months after the German invasion of Poland and the declaration of war by the United Kingdom and France, Elena wrote a letter to the six European queens still neutral (Denmark, Netherlands, Luxembourg, Belgium, Bulgaria and Jugoslavia) in order to avoid the great tragedy the second world war would become. On 25 July 1943 Victor Emmanuel III had Benito Mussolini arrested. The king left Rome on 9 September to flee to Brindisi with the help of the Allies and Elena followed her husband in his escape. In contrast, on 23 September their daughter Mafalda was arrested by the Nazis and sent to Buchenwald concentration camp, where she died in 1944. Following the war, on 9 May 1946 Victor Emmanuel III abdicated in favour of his son Umberto. The former king assumed the title of Count of Pollenzo, and went into exile to Egypt with Elena.